This is a huge week at CIL to invest into our community through giving and volunteer hours. Operation Christmas Child THIS Week! You can share the love of Christ with children around the world through Operation Christmas Child. Pack a shoe box with Christmas gifts and drop it off until Monday (Nov. 19) at 12:00pm (CIL is an official collection site). OCC adds a booklet with the gospel message and delivers the boxes around the world. In the hands of local churches, they become powerful tools for evangelism and discipleship. If you are available and would like to help, please sign-up here! You can also email ciloccinfo@gmail.com for more info! THANK YOU! Saturday, November 17 is our Thanksgiving Blessing! Our goal is to give away 185 fresh turkeys and all the ingredients for a family Thanksgiving meal for local families. Your gift of $25 will completely fund Thanksgiving dinner for someone who might be unable to provide that special meal without help. We currently have 150 sponsored. Will you take time to donate now (click on “Online Giving” at the bottom of the page) so we can fund all 185 meals? The assembly team will gather on Friday evening, November 16 at 6:30pm to prepare the bags. 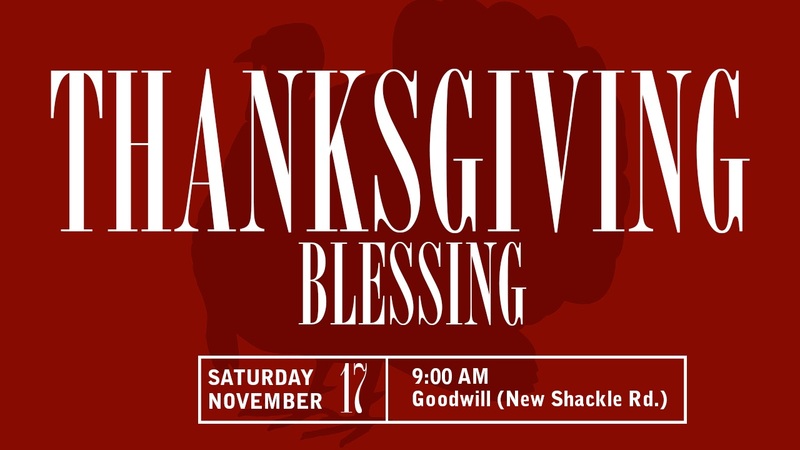 Volunteer sign-in on Saturday morning is at 8:00am, with the give-away beginning at 9:00am in the parking lot at the Goodwill Store on New Shackle Island Road. If you want to volunteer for Friday night packing or Saturday morning distribution, contact Gala Johnson at 615-440-6127. Pastor Aaron will be preaching a special Thanksgiving sermon this week (November 18), so join us at 9:00am or 10:45am.